T-72 metal tracks RMSh type. The T-72 is one of the iconic tanks of modern warfare and it is hard to say which of the conflicts haven’t used this tank since it was produced. 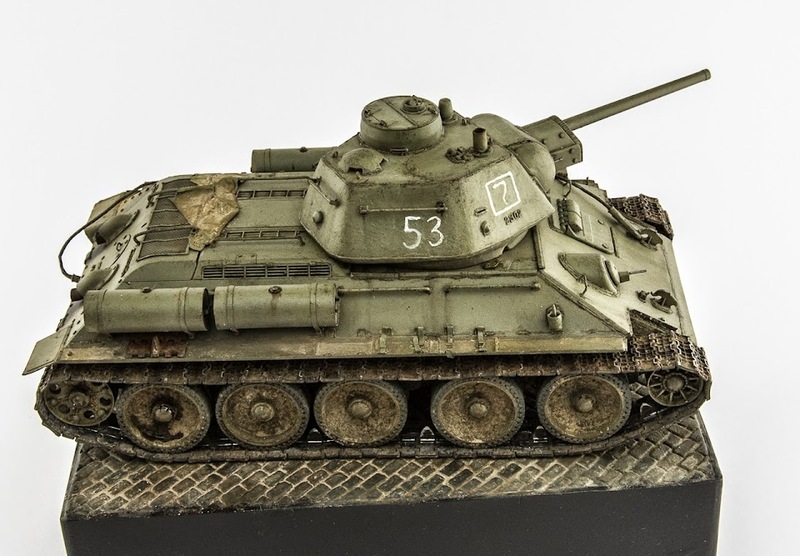 Modellers like the T-72 models and they have a wide range of versions and modifications, both Soviet made and those made in the Warsaw pact countries. Until the recent appearance of the Trumpeter kit (which is also a different version) the Tamiya vulnerable offering had dominated the market (and still is in most of modellers stashes). Of course, made many years ago it has vinyl tracks included and therefore the replacement is almost unavoidable. Here, the question lies within the compromise between accuracy, price and also personal preferences. Resin tracks from Master Club, styrene from Trumpeter, metal from Friul model and now metal from Master Club. What new is offered in the current set (MTL35049)? Similar to resin tracks that were available from Master Club earlier the set MTL35049 replicates RMSh single pin type tracks with rubber bushing. Tracks of that type have been used since 1970 and offered advantages over the T-64 tracks that were tested simultaneously – T-72 during the tests showed superior mobility performance with RMSh tracks as well as lower fuel consumption. The difference between previous set of resin tracks is of course the material that is easier to paint and handle and of course more realistic appearance due to natural weight of the metal links. The track pins are given as resin parts and these should be inserted on both sides of the tracks. Similar to the real track pin they have hexagonal heads as in real RMSh the bushing is fixed by hexagonal bolts on both sides. The shape of the tracks is authentically reproduced and I like the finesse of metal casting. Total 96 tracks are required per side, meaning that from a set with 204 tracks you will get some spares. The assembly is simple – the tracks must be aligned one to one and then the pins are inserted into the holes without any pressure using tweezers. Unlike the Panzer IV set there was no need to probe the holes and the assembly of the chain sufficient to cover the sprocket went really fast. The fit of these tracks to Tamiya sprocket is perfect. When compared to Friul track links Master Club product offers several improvements – finer casting, realistic track pins with hexagonal heads and also they are closer dimensionally to the real track. Master Club metal tracks measure 16.2mm wide, Friul has 17mm and the real tank tracks converted into 1/35th scale will give you 15.4. The pitch of the tracks is also accurate – 4mm (140 mm on real tracks). Overall, I think it is a great set for those who would like to have accurate metal tracks for their Tamiya model. The price might be high for some of us but Tamiya kit requires a lot of investment into aftermarket anyways. As for the new Trumpeter kits – they use a different set of tracks, similar to T-90 and I will try to review that in the future. Highs: Fine cast realistic RMSh tracks, pins with hexagonal heads. Lows: 0.8mm size difference to the original tracks downscaled to 1/35th scale. Thanks. I started painting the tracks for T-72. This is after burnishing fluid. Btw, one thing that I realized that you must not do with these tracks - force dry paint with heat. Resin will be deformed quickly in heated metal! Nice! Did you pickle them in the solution before or after assembly? Great patina to the tracks Roman, which brand solution did you use? Is that photo after washes too - or straight after the solution? And yes, lovely T-34! Thanks, I burnished them fully assembled! Thanks, Mike! I used blue solution, the one from Uschi van der Rosten (Now packed by AMMO of Mig and earlier by AK). No further treatment on these, just blackened and air dried.